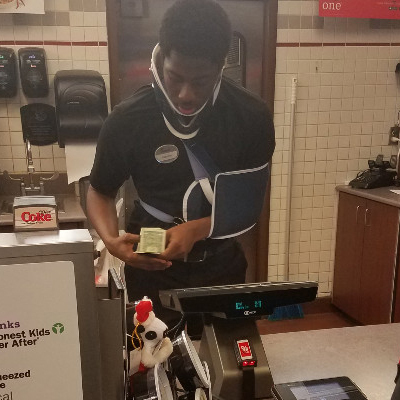 If the holiday spirit has left you feeling particularly generous, here’s a somewhat unexpected way you can be more charitable: donate money to an injured Chick-fil-A employee so he can help feed the homeless. According to Today, earlier this month, Cameron Nelson dropped by a Chick-fil-A in the Indianapolis suburb of Avon to grab something to eat. In what turned out to be a fortuitous twist, the drive-thru was line was a bit long so he went inside: That’s where Nelson saw Jakeem Tyler, an 18-year-old student working behind the counter despite wearing a sling and neck brace. “When I placed my order, I asked him what happened...he said he was involved in a car accident, but he was working cause he needs the money and also wants to feed the homeless for Christmas and needs the cash,” Nelson later wrote. To help further Tyler’s cause, Nelson launched a GoFundMe campaign on December 9 and began spreading the word. In the ensuing eleven days, over 1,700 people have donated over $34,000. If you’d like to donate, the campaign is still open. As many people have suggested in the page’s comments, you should keep in mind that you are donating to a GoFundMe campaign, not quite an official charity. However, even Chick-fil-A has discussed the spreading story. “He is an inspiration both in terms of his work ethic and commitment to serving others,” said Chris Tincher, the owner of the franchise where Tyler works.